There’s a very disturbing scene in the first half of Maleficent; one of the most disturbing I can recall seeing in a modern movie rated PG. (Spoilers ahead) The title character, embodied with regal menace by Angelina Jolie, is sitting in the woods with who, up until this point, has been her One True Love. At the request of the king, who was wounded by the horned fairy in an earlier skirmish near the border of their two realms, this man drugs Maleficent on their date so he can chop off her wings. For a movie that aims to rewrite the squeamish gender politics of the 1959 Disney cartoon, a scene like that becomes even more disturbing because of the kid-friendly rating. Jolie dominates the movie from the moment she flies on screen. Director Robert Stromberg gives her every opportunity to glare, smirk and otherwise chew through the mediocre screenplay. This is a Disney-fied take on the Oz update Wicked, retelling the story of Sleeping Beauty so that the villain’s motives are sympathetic. However, her screen presence clashes violently with the overly whimsical Elle Fanning, who plays Aurora. This is even more noticeable because Maleficent and Aurora’s interactions are at the center of the story here. There is a scene where Maleficent’s brooding by a forest pond at night while nearby, neon rainbow fairies dance around the cursed teen princess while she violently giggles. In that crucial cursing scene, Stromberg creates an almost identical real-life staging of the cartoon. Maleficent storms through the castle’s main hall as the “good” fairies bless the newborn princess. Jolie is at her menacing, over-the-top best here, making her former flame (now the king) quake in his boots and beg for her not to curse his daughter. As that king, Sharlto Copley isn’t in the same league as Jolie. Her sinister inflections add an odd calm to the CGI overkill. His obnoxious performance is only matched by the trio of young fairies that raise Aurora after the curse. This was especially disheartening given that two of them are played by Lesley Manville and Imelda Staunton, two incredible actresses who are given only tired, broad comedy scenes here. Much like Wicked, perspective is this movie’s subject and knowledge of the original story (or in this case, the Disney cartoon of the original story) is key to appreciating it. The many, varied contradictions further damper that appreciation. 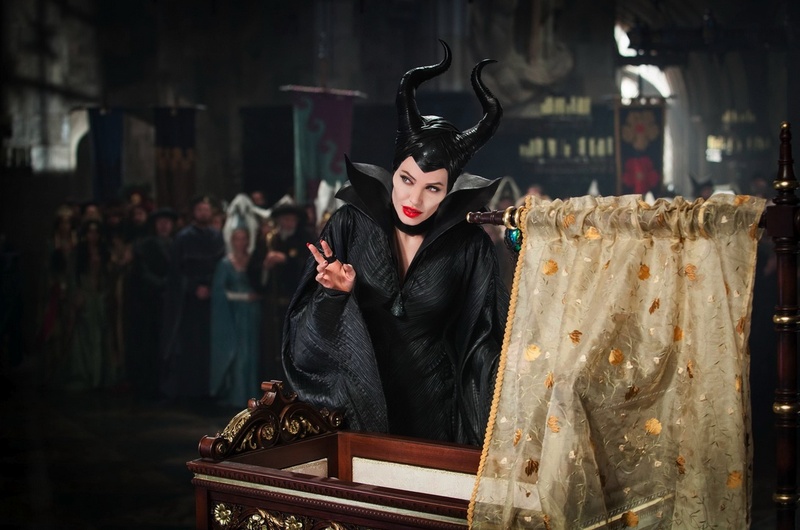 The boisterous performances of Copley, Fanning, et al don’t mesh with Jolie or the pensive, steady way Stromberg tries to tell much of Maleficent’s story. Action sequences that bookend the movie competently illustrate the industrial patriarchy versus Mother Nature conflict, but also feel at odds with the tone of everything in between. Maleficent rests on the horns of its star, and nearly every single other aspect undermines that. This entry was posted in Reviews and tagged Angelina Jolie, Disney, Elle Fanning, Maleficent, Maleficent review, Sharlto Copley, Sleeping Beauty by matterspamer. Bookmark the permalink.